Quincie P. Morris, teen restaurateuse and neophyte vampire, is in the fight of her life — or undeath. Even as she adjusts to her new appetites, she must clear her best friend and true love, the hybrid werewolf Kieren, of murder charges; thwart the apocalyptic ambitions of Bradley Sanguini, the seductive vampire-chef who “blessed” her; and keep her dead parents’ restaurant up and running. She hires a more homespun chef and adds the preternaturally beautiful Zachary to her wait staff. But with hundreds of new vampires on the rise and Bradley off assuming the powers of Dracula Prime, Zachary soon reveals his true nature — and a flaming sword — and they hit the road to staunch the bloodshed before it’s too late. Even if they save the world, will there be time left to salvage Quincie’s soul? With a wink and a nod to Bram Stoker, New York Times best-selling author Cynthia Leitich Smith unites the casts of TANTALIZE and ETERNAL in a delicious dark fantasy her fans will devour. Have you damned me? I wondered, staring over my shoulder at the lanky devil in dark formalwear. The one with honey cream sauce on his collar and blood on his tie, the one who’d so newly remade me into the same kind of monster he was. It was past 2 a.m. in the dining room of my family’s Italian restaurant, and moments earlier, I’d agreed to a fool’s bargain. To drink deeply from the throat of the boy lying beneath me, the boy I loved, on the condition that if I could wrench myself away before taking his life, the seductive fiend known as “Bradley Sanguini” would concede defeat, leave us in peace, and abandon Austin, Texas, forever. Brad understood the thirst, the intoxication, far better than I did, and he’d acted like I had no shot at it. Lost in the salty red mist, the sweet satisfaction, for a few moments, I’d feared he was right. But somehow I’d torn myself from the blood, the bliss. And won. His full lip curled, and the vampire chef turned away to slip through the crimson velvet drapes separating the dining room from the foyer. Seconds later, I heard the front door open and gently shut. Good riddance. In that moment, I didn’t give a damn whether the monster kept his word, whether that was the last I’d see of him. It was enough that he was gone for now. Then Kieren’s whispers drew my attention. Kieren Morales, my best friend and true love, it sounded like he was praying. And why shouldn’t he have been? He gleamed with sweat. His hands and neck had been savaged. It was a miracle that I hadn’t killed him. Have you read TANTALIZE and ETERNAL? When you found out that BLESSED crosses over the two casts, which of your expectations were fulfilled? What surprised you? Why? Detectives Zaleski and Wertheimer are werepeople who work for the Austin Police Department in a world where the legal rights of shapeshifters are unclear. How do they handle that situation? Do you degree or disagree with the approach they take? Why? In TANTALIZE, Quincie has strong relationships with Vaggio and Uncle Davidson. In BLESSED, Nora and Freddy walk into her life. In what ways do these new relationships parallel the old? In what ways are they distinct? Quincie is dedicated to Sanguini’s, the restaurant which has been in her family for three generations. Do you know what kind of a career you want to pursue someday? What is your plan for reaching that goal? Do you have a job now? Quincie goes from being under the care of a freewheeling (and vampiric) uncle-guardian to the more traditionally parental Moraleses. How does this affect her on a day-to-day basis? Little Meghan knows what Quincie is, but no one believes her. Have you ever found yourself in that situation, knowing you’re right but unable to get anyone to take you seriously? How did you deal with it? Quincie, Aimee and Clyde are trying to figure out what it means to be a vampire and how to stop the infection from transforming the squirrel eaters. What methods do they use to seek the answers? What would you do in their place? Quincie is studying “The Lottery” by Shirley Jackson (1948) in English class. How does her own situation parallel Tessie Hutchinson? How does Quincie feel about having been assigned a guardian angel? Why? What does Quincie discover about herself and Brad from Bram Stoker’s classic novel DRACULA (1897)? Describe Kieren’s relationship with his parents. What did he learn from the pack about being a Wolf? What did he learn about himself? What did Roberto and Meara Morales learn? How is Quincie and Kieren’s relationship like Zachary and Miranda’s? How is it different? What would you wear to Sanguini’s? What would you order from Nora’s new menu? Are you predator or prey? Cynthia Leitich Smith is the acclaimed and best-selling author of TANTALIZE, ETERNAL, and several books for young readers. About BLESSED, she says, “Who hasn’t felt like their life is over? Like they’re all alone, facing an infernal storm? That’s when a little faith can save you, when you’re fighting the hardest to believe in yourself.” A member of the faculty at the Vermont College of Fine Arts MFA program, she lives in Austin, Texas. Q: Could you explain how the TANTALIZE series works? If you don’t want any spoilers, TANTALIZE and ETERNAL may be read in either order. But BLESSED crosses over the two casts and picks up right where TANTALIZE leaves off. TANTALIZE and BLESSED are told from Quincie’s first-person point of view. ETERNAL is told from Miranda and Zachary’s alternating points of view. Two of my short stories are set in the universe—”Haunted Love,” which appears in IMMORTAL: LOVE STORIES WITH BITE, edited by P. C. Cast (BenBella, 2008) and “Cat Calls,” which appears in SIDESHOW: TEN ORIGINAL TALES OF FREAKS, ILLUSIONISTS, AND OTHER MATTERS ODD AND MAGICAL, edited by Deborah Noyes (Candlewick, 2009). Both are marketed to ages 12-up. Graphic novel tie-ins also are in the works. The first, TANTALIZE: KIEREN’S STORY, is being illustrated by Ming Doyle and will be published by Candlewick in fall 2011. Q: What is the relationship of the series to DRACULA? The concept is that the events in Bram Stoker’s classic novel were loosely based on fact. Read in order of publication, the storyline of each of my novels comes closer to Stoker’s. A fourth will be drawn from the count’s early history, preceding Stoker’s timeline (but referenced in his book). The series also takes on a number of Stoker’s classic themes, including the “dark” foreigner (which back in the day meant Eastern European) and gender and power. 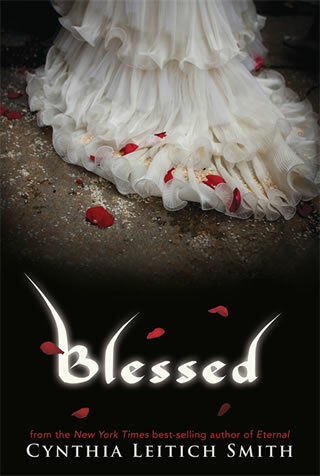 Q: What are the other major literary influences in BLESSED? They’re also listed in the author’s note, but Shirley Jackson’s “The Lottery” (1948) is probably the most significant. I remember reading it for the first time in freshmen English at the University of Kansas. What struck me most was the question of when we should shrug off tradition and when we should embrace it. The Wolf pack is based in Michigan, and I’m a graduate of The University of Michigan Law School in Ann Arbor. The fictional town, New Schwarzwald, Michigan, is loosely based on German-American communities in that state and here in Texas. I love Michigan. The landscape is gorgeous, inspiring—perfect for my Wolf folk. Q: How does Quincie change from TANTALIZE to BLESSED? In TANTALIZE, Quincie is blood drunk and in the midst of her transformation, which makes her an unreliable narrator. In BLESSED, she’s on the other side of that process. She’s facing greater temptations, but she’s more herself. In terms of interpersonal support, her world is likewise turned upside down. In TANTALIZE, she’s used to be “supervised”—if you could call it that—by a largely absent/inattentive uncle-guardian. But in BLESSED, she has Nora, Freddy, the Moraleses, and guardian angel Zachary all looking out for her. Q: What are the special challenges of writing a series? Each writer’s approach is unique, but I try to make sure that each book tops the previous one in terms of the intensity of the plot AKA the protagonist(s)’ external arcs. Beyond that, I find remembering minor details difficult. Was that chair in Quincie’s bedroom rattan? Who did Miranda besides Tolkien and C.S. Lewis? I end up writing with all of the previous documents pulled up simultaneously. The search function is my friend. At one point, I tried to maintain a bible for the world. But then the deadlines kept going, the universe continued to grow, and it became impossible to keep up. Fortunately, I’m compulsive about checking that sort of thing, and I have first-rate editorial support and guidance. Q: How are you and Quincie alike? Different? Both Quincie and I are ambitious, loyal, funny, and passionate in the broadest sense of the world. We embrace big projects and tend to think of ourselves as leaders. I’m more social and more bookish. She’s more impulsive when it comes to conflict. Then again, I have a few years on her. Q: How long did it take you write this book? It’s hard to talk about BLESSED without talking about TANTALIZE. It’s the same world, the same protagonist. My first notes are dated late 2001, early 2002. I spent a fair amount of time world building and reading preceding Gothics all the way back to the Victorians and even back beyond that to the oral stories that spawned the whole tradition. That said, I have worked on other manuscript along with the series. Over those years, I’ve published seven short stories and two picture books. Q: What does the dress on the cover symbolize? The gown on the cover symbolizes Quincie’s mama’s wedding dress, which she wears in the final battle. Beyond that, Quincie’s identity has always something of an extension of her mother’s, especially in that they both love the restaurant so much. By putting on the gown, Quincie embraces her past while fighting to define herself, to carve out her own future. 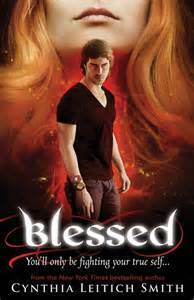 Q: Is it pronounced “blessed” or “bless-ed”? A: Either is fine, but I say “blessed” with one syllable.